Dyes have found a wide variety of uses in the cosmetics industry. Be it the hair dyes or lipsticks or nail polish shampoo everywhere there is wide use of dyes. Let us look at hair dyes. Most of the commercial hair dye formulas available now are complex, that uses bunchful of ingredients, and the formulas also differ considerably with manufacturers. Since we are interested in the dye part let's see what kind of dyes are used in making of hair dye. The dye chemicals that are used usually consists of amino compounds, like 4-amino-2-hydroxytoluene and m-Aminophenol. Pigments of Metal oxides, like titanium dioxide and iron oxide, are also used. 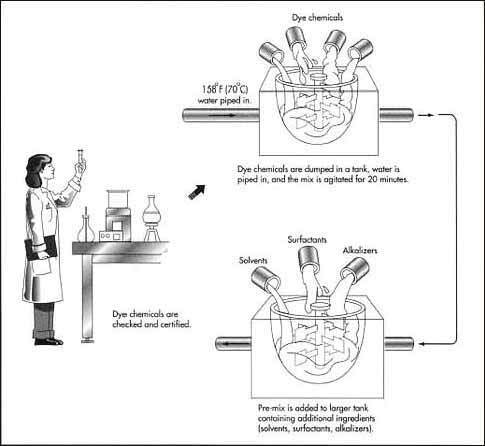 The process of manufacturing hair dye is illustrated in this diagram. Chromium Dioxides Shades range from dull olive green, to a blue green, or bright green, finds use in most categories of cosmetic preparations but prohibited for use in lip products in the USA. Ultramarines Shade range from bright blue to violet, pink and green also, not allowed for lip products in the USA. Iron Oxides Three basic shades: black, yellow and red, finds use in liquid foundations, face powders, and blushers. Mica Mica gives a natural translucence when used as face powders and powder blushers. Manganese Violet Shade is purple. Iron Blue Color is dark blue, used in a wide range of applications. White pigments have a wide use in all cosmetics, they show extremely good covering powder, are almost totally inert also extremely stable to heat and light.